On a quiet back street in central Madrid, just a five-minute walk from the famous Prado Museum, lies Motteau, one of the city’s newest and most heavenly artisan pastry shops. 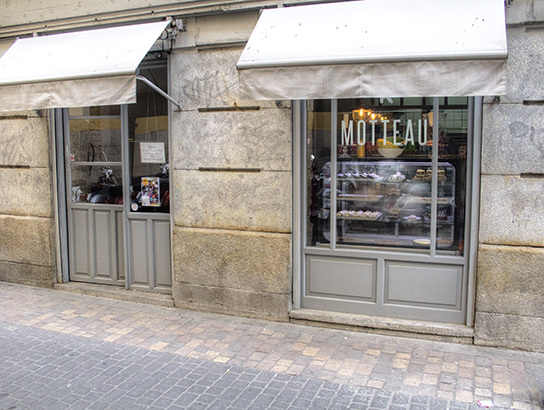 Motteau is not just another pretty face in Madrid’s hip Neighborhood of Letters, it is the impassioned effort of one man to invigorate the city’s lackluster bakery scene through his supreme quality sweets. The man behind the project – owner, baker, and waiter wrapped up in one – is Buenos Aires native Juan Manuel D’Alessandro. In 2005, Juan and his husband would leave the Argentine capital to start a new life in Madrid. Little did Juan know, that a decade later he would walk out on his high-powered, 80-hour a week job, to revive the profession of his great-grandparents the Motteaus, owners of a local pastry shop in 19th century Normandy. As part of one of the waves of emigration from Europe to Argentina, Juan’s ancestors would cross the Atlantic and resettle in Buenos Aires. Over a century later, Juan himself would make that voyage in reverse, re-linking the family to the old continent. Although happy in Madrid, his intense work schedule led to burnout, right as Juan was turning 40. Not a midlife crisis, but rather a midlife realization that it’s never too late to follow one’s passions, manifested here in a love of baking and a serious sweet tooth. Juan’s inspiration to “reopen” Motteau in the heart of the Spanish capital last year may have seemed risky at first. The economic crisis was in its seventh year, and “luxury” items like artisan cakes and tartlets may not have seemed like a safe bet, even if the butter comes all the way from Normandy. But in spite of the crisis, Motteau is yet another example of Spain’s successful artisan food businesses, showing us once again that quality conquers all. Since he opened last summer, Juan has quickly cemented himself as one of Madrid’s most appreciated authors of artisan pastries. When you visit Motteau, it’s easy to see why. Yes, the cakes and tartlets are amazing, and we’ll come to those in a moment. Motteau is easy to fall in love with however, because in all the right ways, it is the opposite of its competitors. And who are the competitors? On one side we find the genteel shop with a posh neighborhood address. The staff dress in black, wear blue medical gloves, and exchange words only to mention the celebrity chef who has loaned their name to the establishment. On the other side we find the newest branch Café X, whose oven “bakes” prefab frozen dough onsite for ambient aroma. Their cut-price industrial model has become so pervasive in Spain’s big cities, that the average customer now balks at the 4€ that Juan charges for a slice of homemade cake. Luckily for the rest of us, Juan knew that the average customer was not the only customer. Juan’s goal of creating a set of exceptional cakes and tartlets, together with his ancestral connection to France, led him to enroll in the Ecole de boulangerie et Patisserie de Paris, where he spent the entire summer in their professional program for artisan baking, all in French of course (Juan speaks excellent English as well). He followed this up last summer with another course just on croissants, his latest addition to the menu, of which just 16 delicate examples are produced each morning, so get there early! I asked if the program reveals all the trade secrets. Juan smiled, “Half the work is simply finding, and being willing to pay for, the best possible ingredients. Then taking your time to get the most out of each one.” That approach has resulted in a refined menu of fewer than a dozen items, all of which will have you returning for more. “The lemon tartlet is the first to sell out,” Juan admitted. It’s not only one of his personal favorites, but the most labor intensive as well. The silky citrus interior sits over a buttery shortbread base, topped by a thin layer of creamy meringue. Wow, is all I could say when I bit in. Juan’s other favorite is the Tarte Tatin, served warm with half and half on the side to be drizzled as desired. A personal favorite of mine is the moist, dense, Imperial Stout Dark-Chocolate Cake. It comes with not one, but two layers of cream-cheese icing. The black beer in question is a Dulce de Leche Imperial Stout, made by Juan’s friend and Madrid micro-brewer Eduardo Martinez. Still not sure what to order? You could also try the white chocolate tartlet with ground pistachio nuts and raspberry candies, or the dark chocolate tartlet with shaved almonds, or more classic choices such as the divine cheesecake, or the carrot cake, or the brownies, or… need I continue? While most customers place their order to go, they miss out on the oasis of calm that is Motteau. Free of obnoxiously loud music and unnecessary noise, the shop sports a pared-down vintage look of exposed white brick and grey wall molding that fades into the floor tiles. Tucked around two cast-iron columns are the shop’s three tables, each offering views of the glass-walled kitchen. Only then, watching him work as you savor your tartlet and café con leche, do you truly appreciate the results of Juan’s efforts, producing sweet bites of buttery goodness, day in and day out. Motteau – Calle San Pedro, 9. Open Tuesday – Friday 10am – 2pm, 4:30pm to 8:00pm, Saturday 10:30am – 3pm. Closed Sunday and Monday. Metro Antón Martín or Atocha (both on Line #1). We happened upon Motteau last August, as we were staying only a few blocks away. Their lemon tart was the best I’ve ever had, and I immediately fell in love with Juan and his husband. If we hadn’t discovered it on our last day there I would certainly have been a return customer. Definitely one of the highlights of our trip to Madrid! I’m so glad you agree! It is indeed a special place, and I only wish I lived closer as I’d be there every couple of days. Juan’s star is definitely on the rise, and there very well may lines out the door one day! I was pleasantly surprised when I visited Madrid and the rest of Spain that they had such delicious pastries. I only associated that with the French. My most pleasant memories of Madrid was ordering my morning croissant or other pastry & cafe con leche at La Mallorquina and eating at the bar with the crowd. I’ll have to try this on my next trip.